This might be one of my most favorite paintings, ever. Have you seen this in person? It’s huge. The canvas plus frame: 105 1/2 inches x 147 1/2 inches x 6 in (8.75 feet x 12.25 feet). The ferocity displayed in this painting is incredible. The massive stature of the lions, Daniel’s petitionary posture, gah, it gets me deeply. 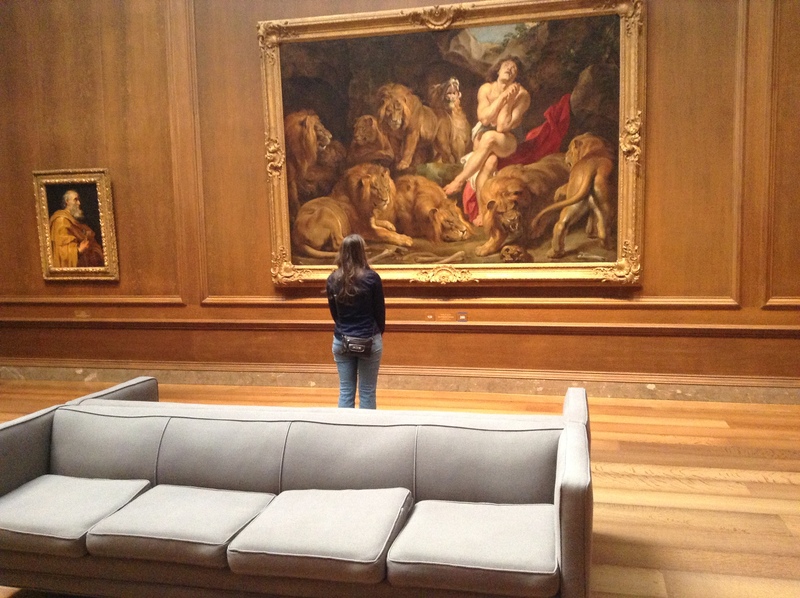 I did a bit of research on lions as a result of admiring this painting. Did you know? The average male lion measures 3.9 feet at the shoulder and weights approx 420 lbs, and on average are 6 feet in length. They can jump out distances up to 10 meters in length or up about 10 feet high (according to various internet resources, sources not cited because it can all be easily checked and the approximations are mostly for effect, but mostly wikipedia). So when I read stories from the Bible, it’s easy for me to quickly read a passage of scripture and miss the length of time encompassed in a passage, a page, a sentence, but this painting causes me to stop and ponder and rethink the passages in scripture that a) this painting depicts and b) include lions elsewhere in the Bible. As Daniel was placed into the den, the king himself confidently said, “Your God whom you constantly serve will Himself deliver you.” And then Daniel was closed in with the lions. The painting depicts a well lit area where Daniel can see each of the lions, but scripture says a “stone was laid over the mouth of the den” so we have no idea how dark it was for the time Daniel was in this potential tomb. We have no idea what his experience was like, if the lions prowled around him(? ), were the lions asleep (? ), did they sniff him(? ), lick him(? ), play with him? I have to wonder about Daniel’s prayer life that night. Was he awake the whole time, pleading with God for his life? Did the angel tell him what was going on? Was he able to confidently rest in this insanely scary environment? The Bible says Daniel’s life was spared because he trusted in God. I’m so curious what this trust looked like played out during those hours in the den. Was he shaking? Trembling? He trusted God with his life, but was this a quiet, calm confidence? Or was it messy, with pleading? Shouting? Was he prepared to die? But he trusted that God would be glorified if he were dead or alive? I’ve wondered through these questions as I’ve stood in front of this incredible painting. Remember what I said earlier about how high lions can jump? Daniel 6:24 describes the gruesome scene later that day when the men who accused Daniel were cast, along with their children and wives into the lions’ den and were overpowered by the lions before they reached the bottom of the den. God was merciful to Daniel even as he was being lowered into the den and then pulled back out!!! Daniel’s experience serves as a reminder to me to trust God in all of my circumstances. He will either provide a means of escape or he will bring me home to be with Him in heaven and either way, He is still good. Ultimately, this painting says to me, trust God Nicole. He has a plan that is bigger than you can imagine, power beyond your wildest dreams and creative solutions you would never imagine. Even when it’s scary, even when you can’t see the way, trust God. Then these high officials and satraps came by agreement[a] to the king and said to him, “O King Darius, live forever! All the high officials of the kingdom, the prefects and the satraps, the counselors and the governors are agreed that the king should establish an ordinance and enforce an injunction, that whoever makes petition to any god or man for thirty days, except to you, O king, shall be cast into the den of lions. Now, O king, establish the injunction and sign the document, so that it cannot be changed, according to the law of the Medes and the Persians, which cannot be revoked.” Therefore King Darius signed the document and injunction. Then the king commanded, and Daniel was brought and cast into the den of lions. The king declared to Daniel, “May your God, whom you serve continually, deliver you!” And a stone was brought and laid on the mouth of the den, and the king sealed it with his own signet and with the signet of his lords, that nothing might be changed concerning Daniel. Then the king went to his palace and spent the night fasting; no diversions were brought to him, and sleep fled from him. Then, at break of day, the king arose and went in haste to the den of lions. As he came near to the den where Daniel was, he cried out in a tone of anguish. The king declared to Daniel, “O Daniel, servant of the living God, has your God, whom you serve continually, been able to deliver you from the lions?” Then Daniel said to the king, “O king, live forever! My God sent his angel and shut the lions’ mouths, and they have not harmed me, because I was found blameless before him; and also before you, O king, I have done no harm.” Then the king was exceedingly glad, and commanded that Daniel be taken up out of the den. So Daniel was taken up out of the den, and no kind of harm was found on him, because he had trusted in his God. And the king commanded, and those men who had maliciously accused Daniel were brought and cast into the den of lions—they, their children, and their wives. And before they reached the bottom of the den, the lions overpowered them and broke all their bones in pieces. *My quotes above are from NASB, just to keep it interesting.